Jason Harrod is a Brooklyn-based performing songwriter known for generous melodies and poetic, image-rich lyrics. He has been songwriting, recording, and performing for over 20 years. For more info on Jason, see his website. The Left Bank is Amelie’s/Rock Hill unique basement space utilized for private and public events and parties. Amelie’s is co-sponsoring this event and opening their downstairs bar (selling wine and beer) for our patronage. We encourage our attendees to avail themselves of this generosity by supporting our artist and our local business. Tickets are $12 (plus tax) online / $15 at the door. Please support our sponsor by enjoying drinks! 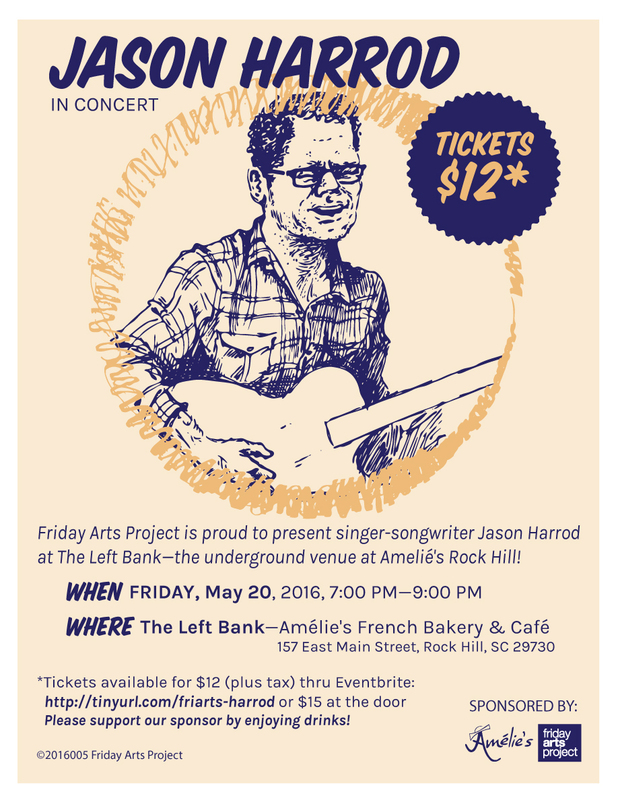 Sponsored by Amelié’s and Friday Arts Project.